I think grits have a delicate, refined quality. Served next to grilled or stewed meats, they are a wonderful alternative to polenta. My favorite is Delta Grind Grits from Oxford, Mississippi. To find a retailer near you, check their website www.gritgirl.net, but any stone ground grits will do. Bring the cream, stock, and water to a low boil in a medium sized heavy bottomed pot over a medium low heat. Turn the heat down to low and add the grits, butter, and salt to taste. Cook for about 20 minutes, until the grits have absorbed all the liquid and are soft. Take a taste. If there are bits of chewy grits, add another 1/2 cup of stock and continue cooking for another 5 to 10 minutes. 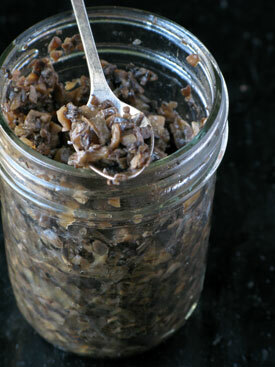 Heat the mushroom duxelles in a small pot. Swirl the duxelles into the grits, or serve the grits with the duxelles on top. Garnish with the minced parsley. Note: You can pour grits into a pie pan, cover with duxelles, and refrigerate for a couple of days. Just reheat in the oven. If you make this dish with polenta, you can let it set up in a pie plate. To serve, sprinkle with Parmesan cheese and place under the broiler until the cheese is golden, then serve it in slices.